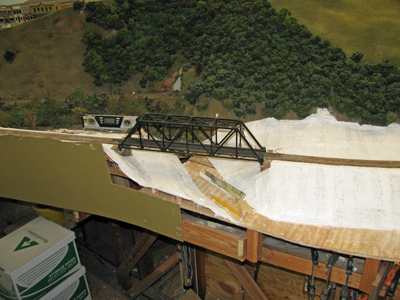 Follow the progress of our Winter 2012 project to realign track at Niles Canyon. An ongoing major project was started during the Y2012 winter shutdown (January - March) to redo about a 20 ft section of trackwork in Niles Canyon. 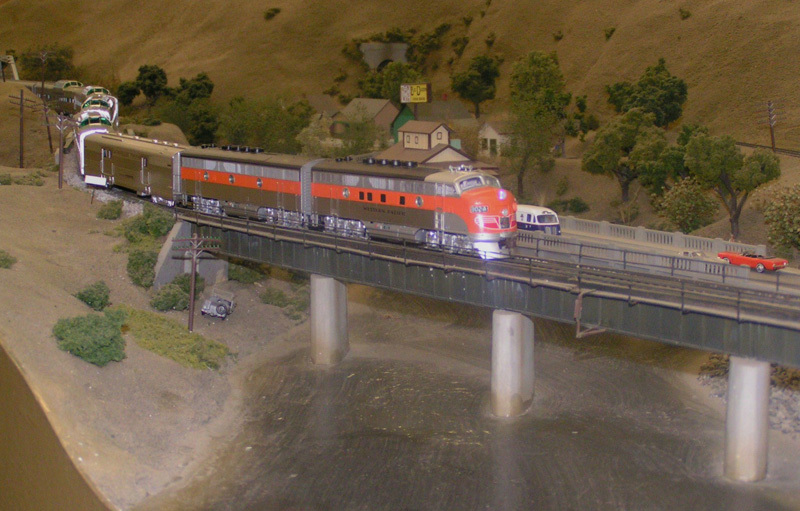 The layout design of some 25 years ago assumed maximum car lengths of about 50 ft. We now find that long cars like autoracks and 90 ft-long intermodal equipment uncouple on a modest vertical curve between the two bridges. The rework eliminates this. 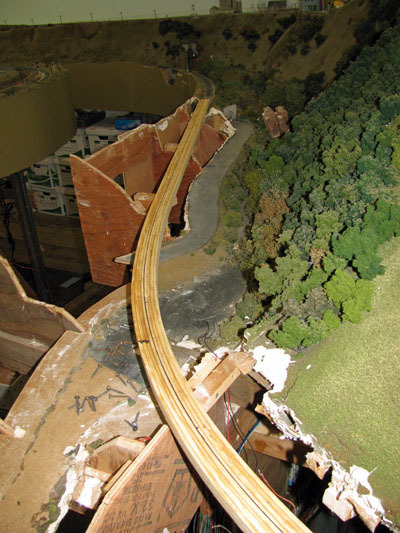 This picture looking rairoad east shows part of the original track and scenery that will be redone to fit the new configuration. The train is westbound, crossing the first of two major girder bridges. Rerouting the track will also require rerouting the river bed (under foliage on right side of picture) and moving this first bridge a little further east. This picture looking rairoad east shows more detail of the road along the river bed. The train is westbound, about to cross the first of the two major girder bridges. 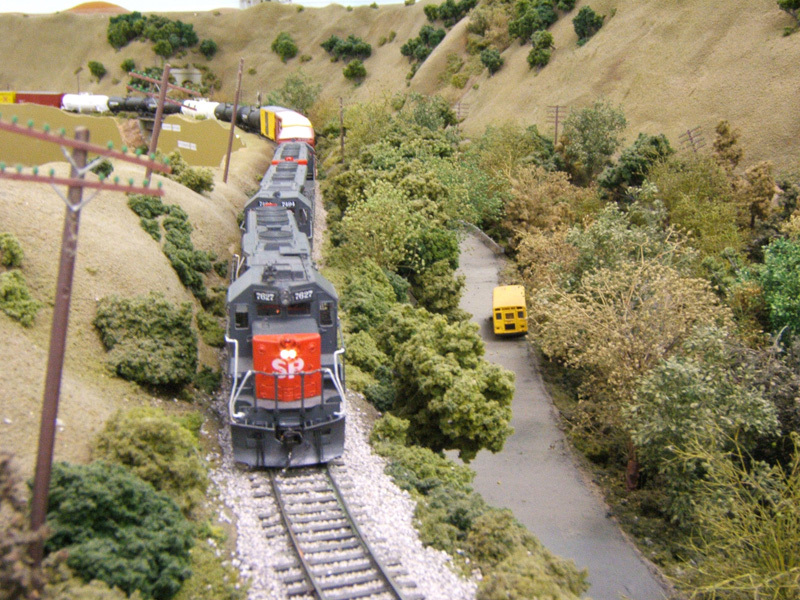 Original scenery looking eastbound towards Niles Canyon. 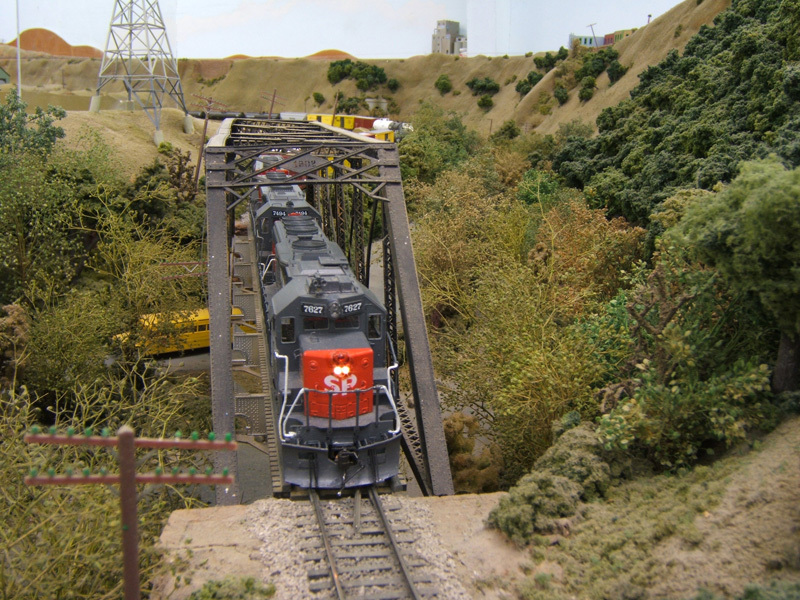 Revised trackwork includes this bridge. A portion of the next bridge eastward can just be seen top left of the picture. 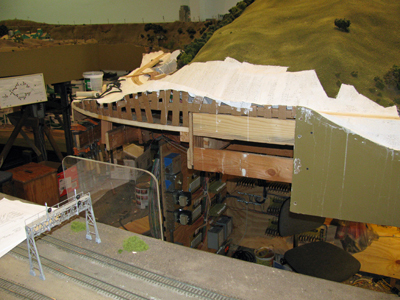 Looking West, scenery and fascia removed and new spline loosely in place down to and including bridge shown on left. 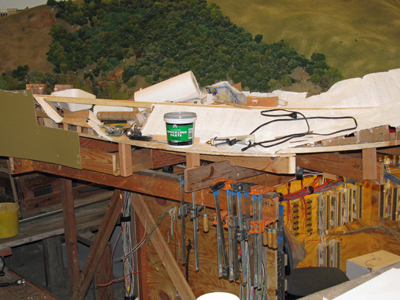 Looking East, scenery and fascia removed and new spline in area shown in top two pictures. The old roadbed and river bed is visible bottom left. Scenery base started. We weave a "basket" of cardboard strips approximating the topography, and then overlay with plaster-impregnated cloth, similar to what doctors use for casts. Another view of the plaster work. The plaster is a lightweight material called "Hydrocal". 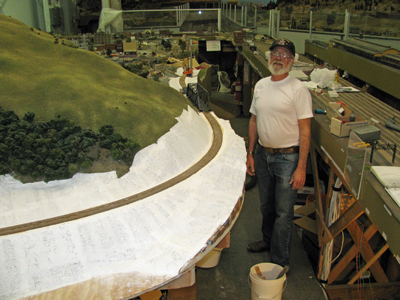 Looking East, with more scenery roughed-in and spline cut for eastmost bridge. Old river bed has been re-routed. 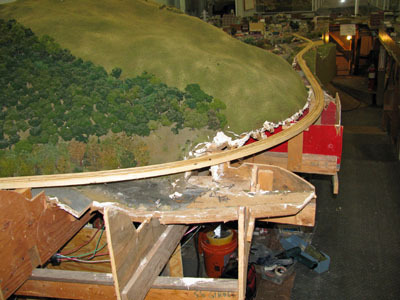 Cork roadbed for track is being installed. Looking West toward Niles junction. Spline cut for placement of Eastmost bridge. Member Paul Culhane, who has been vacuuming all afternoon, poses proudly next to this project that he is helping move along. Back to What's New Page.